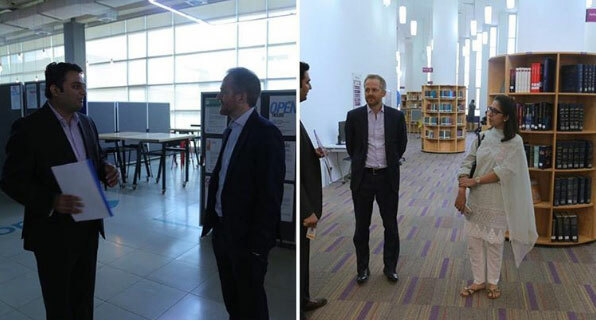 Mr. William Middleton, the Political Counsellor for the British High Commission in Islamabad, visited Habib University on Thursday, 19th July, 2018. After a brief presentation and campus tour, he was escorted to the Arif Habib Classroom, where he met with a group of students. Ten students met with him for an interactive session where he praised Habib University’s “inspirational vision”, saying it was “fascinating being here”. The session with students lasted an hour, where they spoke about a variety of topics which included education, culture, and politics. Discussions included the current political climate, paying close attention to the upcoming elections. This included a unanimous agreement of how strong institutional continuity is required for the country to progress and develop, as challenging as it may be. The students and Mr. Middleton agreed that Pakistan as a country needs to strive towards accountability, regardless of who is answerable for unjust actions. They also discussed what steps need to be taken for better environmental development and investments as a trade-off with development. As a former English teacher, turned journalist, turned political advisor, Mr. Middleton took a keen interest in each student and what they were studying. He asked them about the courses they were taking, and what they planned on doing with them in the future. Students responded with enthusiasm, explaining how Habib University “allows you to do a lot more with your degree than other institutions”, as said by Hashim Abbas, class of 2020. Innovation, job creation, and the change of the current employability and organizational structures within Pakistan were discussed also. Three students from Habib’s alumni batch were present at the session, they asked Mr. Middleton questions about the higher education landscape for post-graduate students, hitting on issues like Brexit and the ability to work beyond studying in the UK. The students brought up political situations around the world, and how they hinder the development of academia and growth for individuals, especially from countries like Pakistan. He also spoke about the way an interdisciplinary education teaches an individual how to accept and adapt to change, saying “if you don’t listen, you will never know how to adjust and change”. The visit concluded with a round of thanks for participation. Mr. Middleton expressed his gratitude to the students and lauded the fact that they were able to discuss sensitive matters with an air of diplomacy.